OpenBTS implements a complete GSM stack for voice and SMS. It also supports GPRS and UMTS 3G data standards. With an off-the-shelf server and software defined radio (SDR), it is now possible to build your own mobile network. These networks can be used to support true fixed-mobile convergence, bring coverage to remote areas or experiment and innovate within the cellular network itself. Because OpenBTS converts all cellular signaling and media directly to SIP and RTP, the integration environment should be familiar. After first experimenting with VoIP in 2004, Michael worked on IMS proof-of-concept projects until 2007, when he founded the AskoziaPBX project, an easy-to-use telephony system now being sold and deployed in over 100 countries. In 2011, he moved on to do VoIP-related research and development for Ubiquiti Networks. 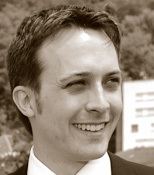 Michael is currently a Senior Engineer at Range Networks, the creators of OpenBTS.